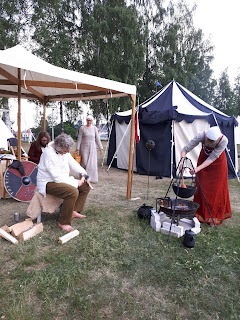 Ever since the beginning of the winter I had planned to stay over at the medieval market in Leksand. 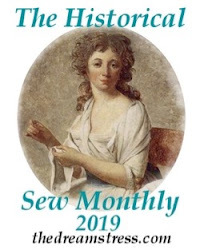 This year the market had made a restart, with new organisers. I must say I liked it better. 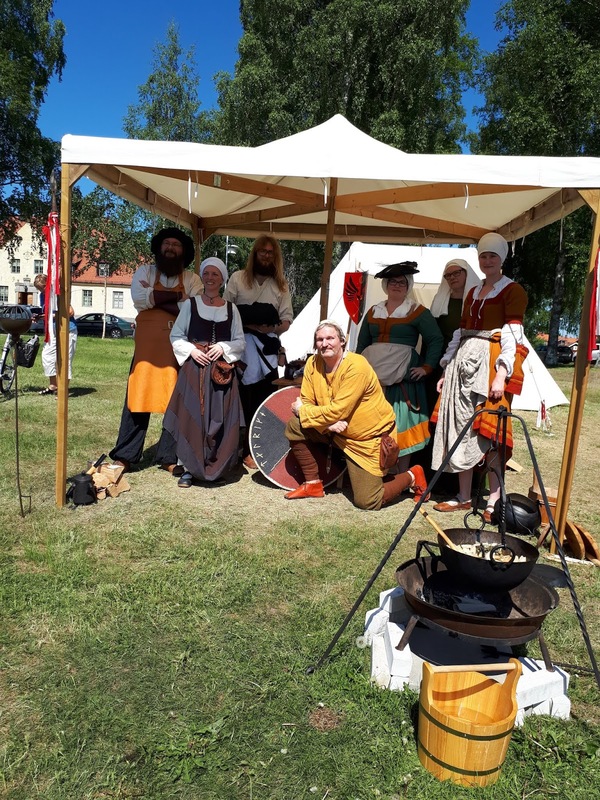 It felt like there was a lot more to see and a lot more of high quality vendors, all in all Leksand is really great medieval market. 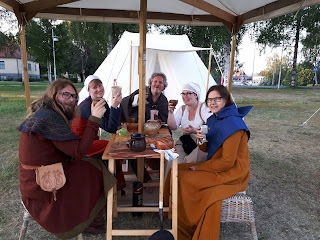 Niklas and Monica from Cosplay Dalarna had promised that me and Linnea could borrow their old tent, since they had bought a new and bigger one. 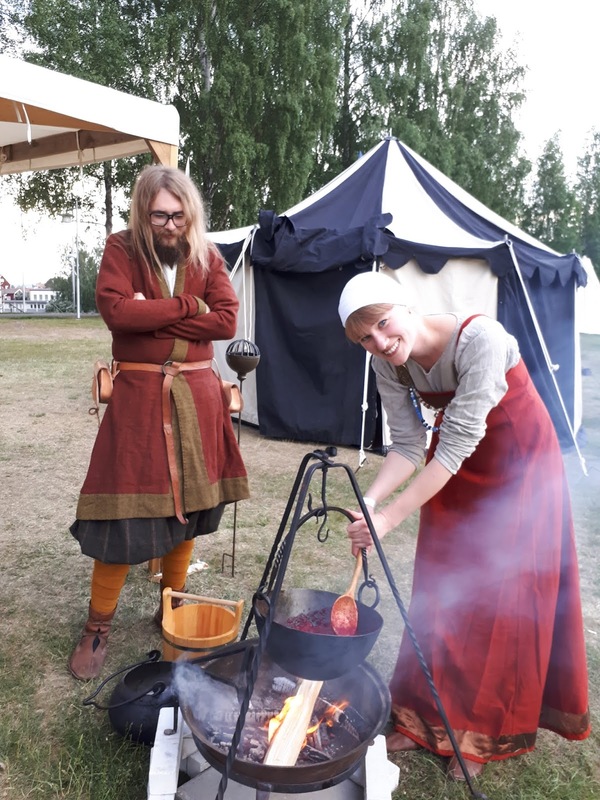 Well after a lot of misfortunes with the tent it was clear that they would not have time to get their new tent up to Leksand in time. Thankfully though the world of cosplayers/costumers is pretty small, and it turned out that Ingeli, one of my best friends in the Nordic Garrison, was also going to Leksand and she could bring her old tent. They were even nice enough to raise it for us so it stood there when we arrived on Friday evening. Here is our little camp all set up. Me, Linnea and Kristoffer (who we had recruited on the way) shared the huge black and white tent, but we spent most of the time under Monica's and Niklas' pavillion. Friday night dinner is getting ready. We had planned the dinner so that each of us would prepare a meal and bring it with us so that we only had to heat it, and not cook it from scratch. Dinner time. Despite the temperature in the day reaching almost 30 degrees it started to get chilly in the evening as you can see by people wearing hoods and caftans. And it turned out that the night would be really, really cold in the night. In fact I didn't sleep at all because it was so cold, and I apparently hadn't brought enough blankets with me. It didn't even help that I had my brand new 14th century night cap. Our huge tent was also to big to be heated up with our body heat. 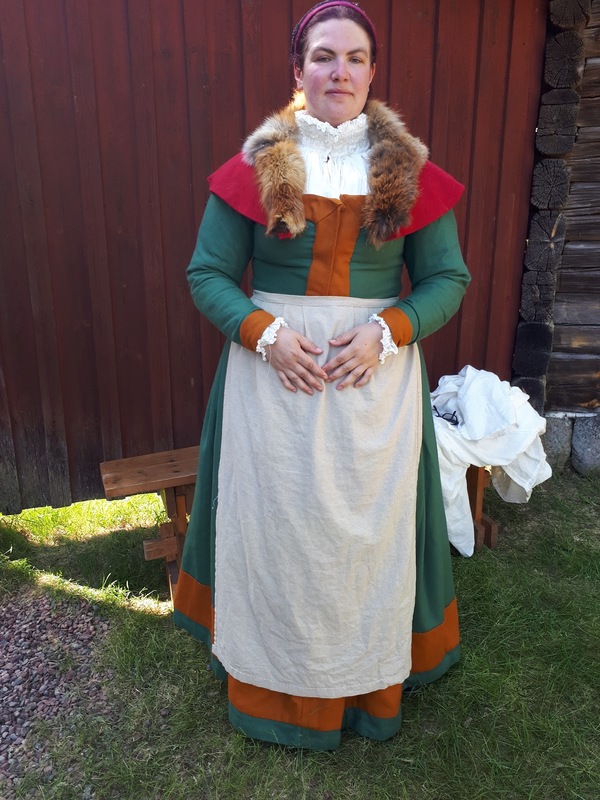 On Saturday morning the temperature started to rise pretty fast though, still I had decided that I would wear my full 16th century outfit. 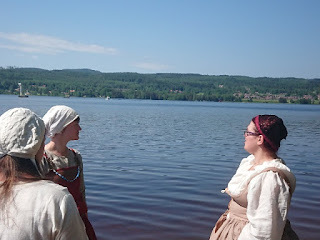 Us campers were also visited by some other friends from Cosplay Dalarna. Here is our group photo, and it's taken by Niclas, who was there in modern clothes. I didn't manage to wear two layers of wool for more than a couple of hours, though. Me, Ann-Sofie and Linnea. I was grateful that I could hike up the skirt, by borrowing a belt from Linnea, in proper trossfrau style. For most of the market I was only wearing my undergown though, since it's sleeveless. I was also very glad that the location is just by the water, so it was nice to go down there and cool down. In historical clothes we just stood there in the water and wet our headscarves before wrapping them on our heads (my hair dye still bleeds so I now have a pink veil) but I had brought modern swim wear as well so when the market closed in the evening I switched to that and made sure to take a really nice bath. On Saturday it was even hotter, and I hadn't planned on wearing anything but the undergown. 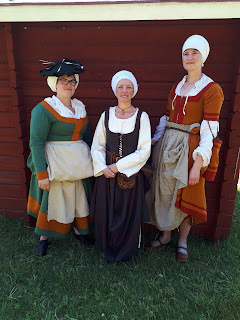 Then me and Linnea offered to take part in the medieval fashion show, they had a landsknecht but no 16th century women. And if I was going to be in the fashion show I sure wanted to show off my best, so I dressed up in all the layers and accessories. Now the temperature was definitely hovering around 30 degrees, and that was too much. I almost got heat exhaustion on the way, and I think my hydration/salt balance still hasn't gotten back into balance a day later. I'm almost melting here, but at least it looks good. 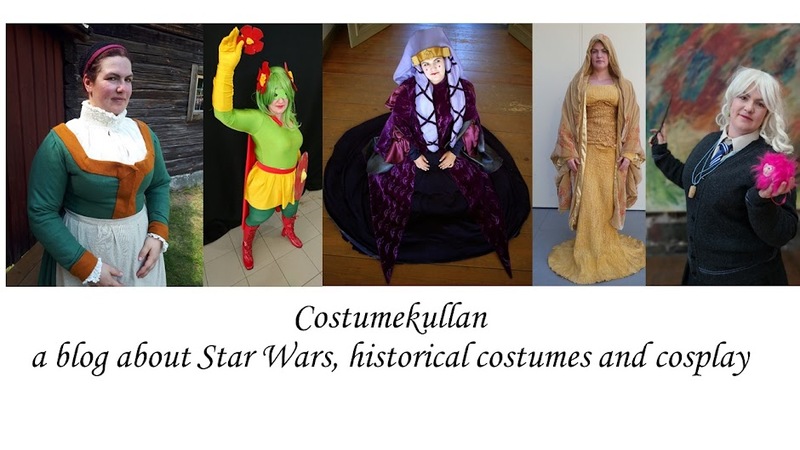 As you might have seen in this post I have a few pieces of clothing, including my ain green gown, that I haven't posted about. I'm going to talk about that in a future post. It is pretty fun that everything I'm wearing in this photo has been made as HSM challenges this year.